I thought this picture was very appropriate during the last week of Lent this year. I took it on the way home from Illinois last week. 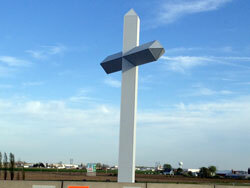 It’s the Effingham Cross which sits right off the highway at the intersection of I-57 and I-70 at Effingham, IL. It’s almost 200 feet tall so it really gets your attention. The cross is a great symbol for us at this time as we reflect on the pain and suffering that Jesus experienced before being crucified for us. We all have crosses to bear in our lives and rather than let them become stumbling blocks we can turn them into opportunities to grow closer to our Lord. I got that opportunity last week when I crashed off my bicycle on a city road and broke a rib and injured by shoulder. I’m having to do everything with my left arm right now and I’m right handed. It is not fun. But as I was starting to deal with the reality of it I just offered it up to Jesus in union with His suffering and for all who are suffering right now, especially some form of physical discomfort or pain. Yeah, it’s not easy to do. It’s easy to feel sorry for yourself and I catch myself doing that. But I’ve made it part of my daily examination of conscience which reminds me why this is a blessing.